6 July 2018, at 12:00a.m. Records compiled by the Occupational Safety and Health Administration (OSHA) reveal that, there are on average 17 “severe” incidents a month in US meat plants. These injuries are classified as those involving “hospitalisations, amputations or loss of an eye”. Amputations happen on average twice a week, according to the data. There were 270 incidents in a 31-month period spanning 2015 to 2017, according to the OSHA figures. Most of the incidents involved the amputation of fingers or fingertips, but there are also recordings of lost hands, arms or toes. During the period there were a total of 550 serious injuries which cover 22 of the 50 states so the true total for the USA would be substantially higher. US meat workers are already three times more likely to suffer serious injury than the average American worker and some fear that plans to remove speed restrictions on pig processing lines – currently being debated by the government – will only make the work more difficult. An employee’s left arm had to be surgically amputated at the shoulder after it was pulled into the cubing machine during sanitation. While an employee was attempting to remove the ribs from the spine of a cattle rib set, his hand made contact with a running vertical band saw and two of his fingers were amputated. An employee working on a sanitation crew pushed the stop button after removing parts from the upper portion of a machine. The employee then placed his foot into a horizontal grinder while climbing down from the machine, causing all five toes on his right foot to be amputated. Chronic ailments are an even bigger issue, leaving many workers permanently disabled, and leading to losses and costs, both individually and publicly. “Every co-worker I know has been injured at some point,” plant worker Eric Fuerstenberg told the USDA as they examined the case for implementing reforms that would include speeding up the line. A meat plant worker who asked to remain anonymous told the Guardian that although he has managed to avoid injury himself, most of his friends have needed surgery at some point. “If you complain about your hands, they just say you’ll be fine… they want you to put ice on it during your break time or lunchtime” – rather than during production hours. 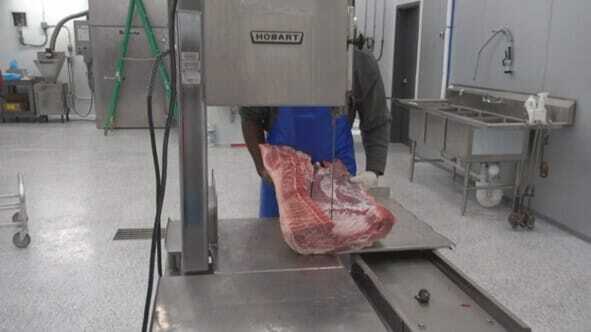 Training has been increased, and in a joint effort with the unions, the government and industry, a set of voluntary ergonomic guidelines for the meat packing industry has been drawn up, described by OSHA as a model for other sectors. “And these efforts have really paid off,” said Mittenthal. According to the most recent data published by the US Bureau of Labor Statistics (BLS) “injury incidence in the meat and poultry packing and processing industries has decreased significantly over the past 25 years, reaching an all-time low of 5.3 cases per 100 full-time workers per year”. In 1994 according to BLS data the incidence rate for injuries for meat packing plants was over 20. But the plans will lead to more injuries, believe unions and workers. 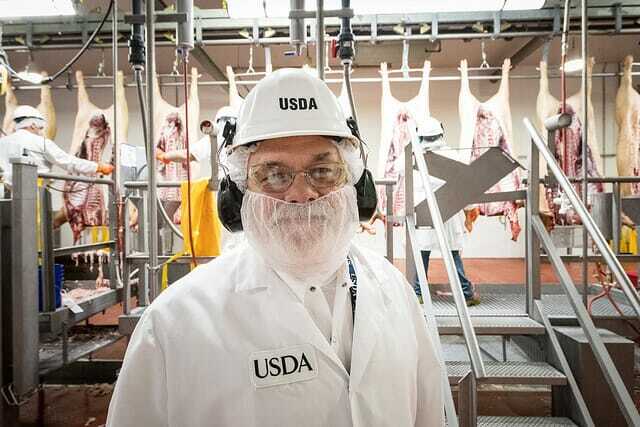 “When it’s production at all costs, people are going to get hurt,” said Mark Lauritsen, head of the meatpacking division for United Food and Commercial Workers (the main union for meat plant workers in the US). But NAMI argues that the removal of line speed caps is not about speeding things up, but about allowing the line inspector to decide a speed that is appropriate for safety. Plants would not be capped at 1,106 pigs per hour, but they could only operate as fast as adhering to food safety rules would allow, said a NAMI spokesperson. In fact, under the pilot programmes that have been running, some plants actually ran more slowly than the current capped rate, they point out. Andrew is an award-winning investigative journalist specialising in food and farming issues. He is the co-founder of the ethical investigative agency Ecostorm and was editor of The Ecologist magazine between 2010 and 2012. His book, the Ecologist Guide to Food, was published in 2014. As well as reporting extensively for newspapers and magazines in the UK and beyond, he's co-produced films for The Guardian, Channel 4 News and KCET/Link TV, among others.